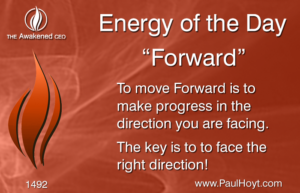 Paul Hoyt – Energy of the Day: Forward! Energy of the Day: Forward! Get clear with your vision, set your intentions, keep your eyes on the goal, and move Forward in your projects today! Copyright 2017 Hoyt Management Group | All Rights Reserved.